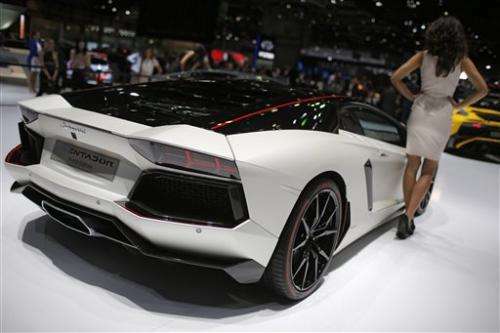 It is the high-end, impossibly expensive but seductively powerful sports cars that will get crowds gawking and cameras flashing when doors open to the public Thursday. There are new models from storied brands like Ferrari, Lamborghini and Mercedes but also prototypes from smaller manufacturers. "There are an awful lot of fast cars and supercars on display this year," said Jim Holder, editor-in-chief of Autocar magazine. "What you see now is an industry that has got its swagger back and wants to show off a bit rather than put its hair shirt on about high miles per gallon and these slightly more mundane things." 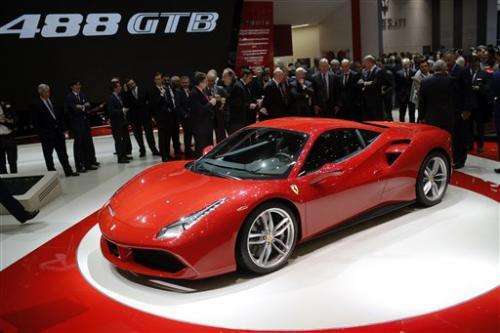 The legendary sports car maker from Maranello, Italy, is sure to draw crowds with its 488 GTB. Drawing on the company's long racing history, its newly designed turbo-charged V8 engine accelerates the two-seater from stop to 100 kph (0 to 62 mph) in 3 seconds flat. By comparison, the fastest and most powerful Corvette ever built, the Z06, does 0 to 60 mph in 2.95 seconds. Ferrari CEO Amedeo Felisa vaunted the engine's characteristic Ferrari sound, the "deep, seductive soundtrack" in Ferrari's words. "It's the sound of a sports car," Felisa said in answer to questions from reporters who noted that Ferrari's turbo-charged California had lost that trademark scream. Ferrari has even invented a new shade of its legendary red color for the 488's paintjob. Millions of tiny particles are suspended in the paint to give it extra glossiness. During a demo, the driver for the Superveloce (superfast, in Italian) made sure to gun the engine and show off the metallic music made by its mighty 750 horsepower engine. It has the classical Lamborghini design—low-slung, angular and lethal-looking with lots of expensive carbon-fiber materials. It can hit a top speed of 217 mph (350 kph) and its powerful brakes can bring it to a stop in only 30 meters (30 yards) from 62 mph (100 kph). It's not exactly environmentally-friendly, however—it puts out 375 grams of carbon dioxide per kilometer, compared with the fleet average limit of 130 grams, and consumes an average 16 liters of fuel per 100 kilometers, or 14.7 miles per gallon. 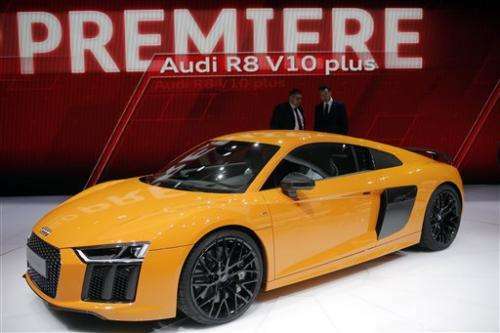 The German luxury car maker from Ingolstadt in Bavaria unveiled its second-generation R8 supercar on its stand in Geneva. With a V10 engine capable of zero to 100 kph (62 mph) in 3.2 seconds, and an aluminum and carbon fiber chassis shared with the Lamborghini Huracan, the new R8 weighs 50kg less than its predecessor while being 40 percent more stiff, Audi says. Style cues from Audi's TT roadster are present, but the muscular angles and scooped out sides scream supercar. European versions of the car will have optional laser-powered high beam headlights with cameras to help drivers see further. Audi is also introducing an electric version of the R8, with a battery pack capable of reaching a range of 276 miles and matching Tesla's Model S in performance. 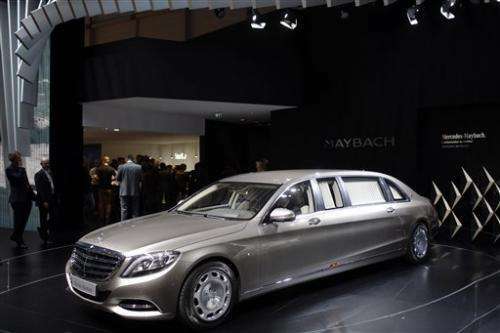 The new Mercedes-Maybach S-600 Pullman is a limousine of nearly unheard of luxury. With armour cladding as an option, the new Pullman is more than a meter longer than the next biggest Mercedes S-class and significantly taller, too. After noting that John Lennon owned an original Pullman which he modified by adding a state-of-the-art Hi-Fi system, Mercedes unveiled the massive limo beneath a video recording of the Fab Four performing "Can't Buy Me Love" - and at over $500,000, few in the crowd could contemplate buying the car either. Four quilted leather reclinable seats face each other in the limo's rear, with a champagne cooler in easy reach. A retractable glass partition can transform from transparent to opaque at the push of a button for more privacy. What's a minivan doing on this list? The new 2-Series Gran Tourer might not be a supercar, but it is a blinged-out people mover for "young active families," the Munich-based car maker says. BMW says it's the first premium compact able to carry up to seven people, including up to five child seats for those carpool runs to soccer games or birthday parties. 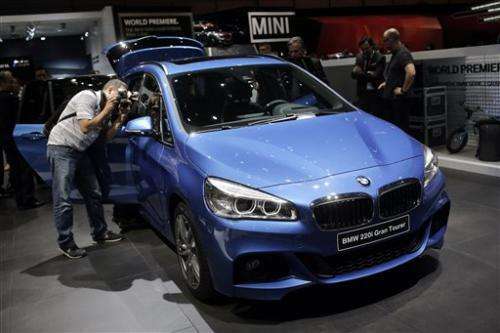 Based on BMW's Active Tourer, the 'Gran' version adds more space as well as seating configurations. With rear seats folded into the floor and the middle row seats collapsed, storage space can be added or removed as needed—up to 67 cubic feet according to BMW. The $30,000 van aims to help BMW take on rivals such as Renault's Grand Scenic in a market category that BMW hasn't traditionally competed in.